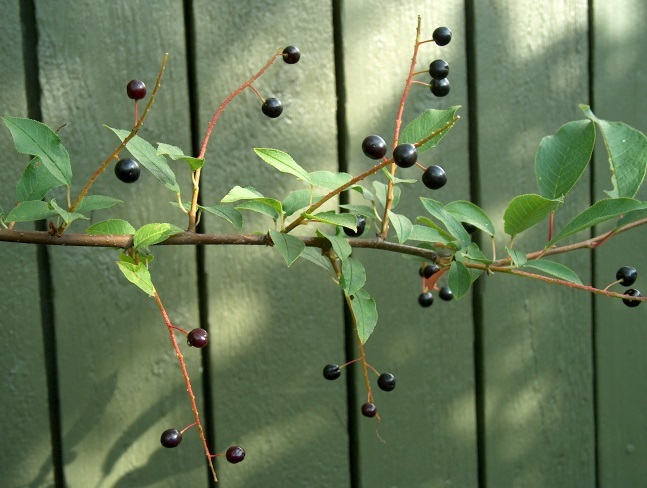 Prunus padus is a tree to 15 m tall, bark black, finely grainy, twigs dark, with small pale dots (lenticels). Leaves alternate, stalk 1-1.5 cm, blade elliptic to widest above middle (obovate), 6-12 cm long, tip abruptly pointed, base rounded to slightly lobed, margin finely toothed, dull green above, grayish below, usually hairless. Flowers white, 1-1.5 cm wide, fragrant, calyx tube finely hairy inside (use lens), stamens slightly shorter than petals, in unbranched cluster 10-15 cm long (raceme, much like that of P. serotina), late April-May. Fruit fleshy, to 0.8 cm, black, stone slightly wrinkled (Rehder 1986). Habitat: One multi-stemmed tree about 7-10 m tall, with possibly a few small offspring in a formerly cultivated naturalized area.